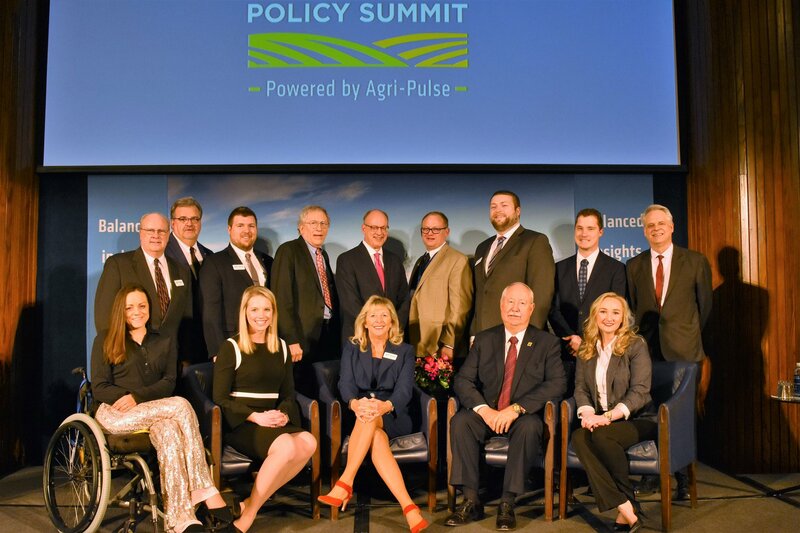 Thank you to all of those who attended, supported or followed our 2019 Ag & Food Policy Summit on March 18th in Washington, DC! It was a jam-packed day of discussion, insights and networking. Hope to see you again next year! For more than 165 years, Anheuser-Busch has been woven into the cultural fabric of the United States, carrying on a legacy of brewing great-tasting, high-quality beers that have satisfied beer drinkers for generations. Today, we own and operate 23 breweries, 15 distributorships and 23 agricultural and packaging facilities, and have more than 18,000 colleagues across the United States. We are home to several of America's most recognizable beer brands, including Budweiser, Bud Light, Michelob ULTRA and Stella Artois, as well as a number of regional brands that provide beer drinkers with a choice of the best-tasting craft beers in the industry. From responsible drinking programs and emergency drinking water donations to industry-leading sustainability efforts, we are guided by our unwavering commitment to supporting the communities we call home. For more information, visit www.anheuser-busch.com or follow Anheuser-Busch on LinkedIn, Twitter, Facebook and Instagram. Edge Dairy Farmer Cooperative provides dairy farmers throughout the Midwest with a strong voice - the voice of milk - in Congress, with customers and within their communities. We are an energetic, progressive organization that represents all dairy farmers equally. Edge is one of the top cooperatives in the country in terms of the amount of milk produced by its members. Under the Federal Milk Marketing Orders, the co-op also provides milk testing verification services and market information. Farm Credit supports rural communities and agriculture with reliable, consistent credit and financial services, today and tomorrow. As customer-owned cooperatives, each of our 73 independent institutions is governed by a board of directors chosen by the customers it supports. This ensures a customer-first approach that helps U.S. agricultural producers feed the world, strengthens the rural economy, and provides jobs that help rural families thrive. We serve every part of agriculture from the smallest operations to the largest – and everything in between. Whether helping a young farm family begin, supporting our veterans as they return home and take up farming or financing U.S. agricultural exports around the globe, Farm Credit is committed to the success of American agriculture. NCFC is a national association representing America’s farmer cooperatives. There are over 2,500 farmer cooperatives across the U.S. whose members include a majority of our nation’s more than 2 million farmers, ranchers and growers. These farmer cooperative businesses handle, process, and market agricultural commodities and related products; furnish farm supplies; and provide credit and associated financial services. Farmer cooperatives also provide jobs for nearly 250,000 Americans, many in rural areas, with a combined payroll of over $8 billion. FLM Harvest is a strategic consulting, marketing and communications agency that helps set strategy, align teams, frame opinions and create demand for clients in the agriculture, food and lifestyle markets. Aimpoint Research™ is a global marketing research firm providing the insight leaders require to make better, more informed decisions that reduce risk, optimize resources and maximize success. Different from other research firms, we blend best practices from military intelligence disciplines with those of the consumer market research industry. Aimpoint Research provides unprecedented insight into the minds of those who most impact our clients' success and help them channel that knowledge into successful organizational strategies. For over two decades, Aimpoint Research has helped corporate, organizational, government, and thought leaders achieve their objectives with actionable intelligence. Since 1929 Farmers National Company has offered professional farm management, real estate sales, and auctions and has expanded to include a complete range of agricultural services for landowners including oil and gas management, forest resource management, appraisals, insurance, consultations, hunting lease network, lake management, and FNC Ag Stock. NCIS is the only entity that fully supports both the state-regulated and federally-regulated lines of the crop insurance business. The organization provides services ranging from actuarial and analytical support to the development of crop loss adjustment standards and industry-wide training for both company staff and industry loss adjusters. As the only organization representing all companies writing crop insurance in the U.S., NCIS, through its education and public relations efforts, serves as the industry voice providing clear and singular messaging to both the media and the public. NCIS staff represent a diverse mix of individuals with training in agronomy, actuarial methods, economics, business, law, and information technology. The National FFA Organization is growing the next generation of leaders who will change the world. With more than 670,000 student members in all 50 states, Puerto Rico, the U.S. Virgin Islands, and Washington, D.C., FFA is the premier youth organization preparing members for leadership and careers in the science, business, technology, and communications of food, agriculture, natural resources, and the environment. The National Milk Producers Federation, based in Arlington, VA, develops and carries out policies that advance the well-being of dairy producers and the cooperatives they own. The members of NMPF’s cooperatives produce the majority of the U.S. milk supply, making NMPF the voice of dairy producers on Capitol Hill and with government agencies. Visit www.nmpf.org for more information. The Agriculture Council of America (ACA) is an organization uniquely composed of leaders in the agriculture, food and fiber communities dedicated to increasing the public awareness of agriculture's vital role in our society. The Agriculture Council of America and the National Ag Day program was started in 1973. We prevent disease. We champion innovation. And we cherish the bond that people and animals share. At Boehringer Ingelheim Animal Health USA Inc. our passion revolves around keeping animals healthy. More than 3,000 people power our U.S. animal-health business, in places that include Georgia, Missouri, Iowa, Minnesota, New Jersey and Puerto Rico. They make up the second-largest animal health company in the U.S. They also form part of a larger, family-owned company with a rich global history. Founded in 1885 in Ingelheim, Germany, Boehringer Ingelheim also focuses on human pharmaceuticals and biopharmaceutical contract manufacturing. Boehringer Ingelheim's animal-health portfolio includes some of the most highly regarded and broadly used vaccines, parasite-control products and pharmaceuticals to help protect pets and livestock from disease. GPG Food helps clients navigate legislative and regulatory issues and shape the debate on today’s most contentious and important food, agriculture, nutrition and sustainability issues. Through its work with corporations, government, nonprofits and advocacy coalitions, the bipartisan practice has a deep understanding of the policies, politics and players at the heart of national conversations on food and nutrition, sustainability, the Farm Bill, agricultural innovation and food insecurity. Complemented by GPG’s leading Public Affairs, Government Relations, Research and Advocacy and Branding talent, GPG Food offers a suite of fully integrated services to help its clients achieve their goals. John Deere works every day to uphold our founder’s core values. Integrity, quality, commitment, and innovation are more than ideals we work toward. They are values we live and breathe – values found in every product, service, and opportunity we offer. We are committed to the success of those linked to the land. The National Association of State Departments of Agriculture was founded in 1916. NASDA is a nonpartisan, nonprofit association which represents the elected and appointed commissioners, secretaries, and directors of the departments of agriculture in all fifty states and four U.S. territories. NASDA grows and enhances agriculture by forging partnerships and creating consensus to achieve sound policy outcomes between state departments of agriculture, the federal government, and stakeholders. The National Pork Board has responsibility for Checkoff-funded research, promotion and consumer information projects and for communicating with pork producers and the public. Through a legislative national Pork Checkoff, pork producers invest $0.40 for each $100 value of hogs sold. Importers of pork products contribute a like amount, based on a formula. The Pork Checkoff funds national and state programs in advertising, consumer information, retail and foodservice marketing, export market promotion, production improvement, science and technology, swine health, pork safety and sustainability and environmental management. For more information on the Pork Checkoff, see www.pork.org. Story Partners is one of Washington, D.C.’s leading public affairs firms – one that clients turn to when results are vital. Our principals have a long history of developing and executing strategies that make a difference – whether our clients are trying to influence the policy debate, increase public awareness, define and dominate a market, position an industry, or achieve a legislative or regulatory victory. We achieve success because we are driven by results, not billable hours. By utilizing both traditional and innovative new media strategies, we change the dynamic of how issues are framed, allies are developed, and stories are told. Syngenta is one of the world’s leading agriculture companies. Our ambition is to help safely feed the world while taking care of the planet. We aim to improve the sustainability, quality and safety of agriculture with world class science and innovative crop solutions. Our technologies enable millions of farmers around the world to make better use of limited agricultural resources. With 28,000 people in more than 90 countries we are working to transform how crops are grown. Through partnerships, collaboration and The Good Growth Plan we are committed to improving farm productivity, rescuing land from degradation, enhancing biodiversity and revitalizing rural communities. To learn more visitwww.syngenta.com and www.goodgrowthplan.com. Follow us on Twitter at www.twitter.com/Syngenta.